I discovered Vamped purely by accident. I was wandering Barnes and Noble after a particularly rough day (some people drink, I buy books) and just saw it out of the corner of my eye. I whipped it off the shelf, was stunned by the awesomeness of the blood-juice box on the cover and figured I had somehow missed this new book. I opened it up and imagine my surprise when I discovered this little gem was published 6 years ago. No joke. The best vampire fiction you’ve never read. I ended up buying it on my Nook (I do that a lot in the store, mentally computing Barnes and Noble member price vs. their e-book price while standing in front of the shelf pointing my Nook at the book like it will do a direct download or something) and promptly forgot about my purchase (remember that horrible, no good, very bad day mentioned above). 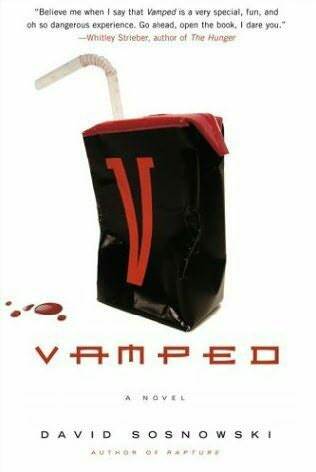 I got around to reading Vamped last week and regret the two months it spent in obscurity lost on my Nook. From the beginning it’s hilarious (and not a little disturbing at points), a view into an all vampire world where humans are more myth than reality and vampires are jaded and bored of their humdrum lives. Written a little ADD, it does jump around a bit, but in a way meant to facilitate the flow of the story, you learn about pertinent details through Marty’s memories before they’re needed. Written first person, told through Marty’s eyes, this book is a quick read and those disturbing parts are usually disturbing to Marty too so it makes it a little easier to stomach and let pass without a second thought. Marty’s one of those jaded vamps, marginally suicidal, and looking to end it all without having to end it all by driving fast without a seat belt and a disabled airbag (those vamps, they’re so edgy) when he stumbles upon a six year old human girl covered in blood and hiding out in the woods. Who promptly stabs him in the gut. Oh yes. Perfectly executed little kid taking down the big bad vampire humor. While Marty’s looking for a delayed gratification snack by taking her back to his apartment, the six year old Isuzu Trooper (best kid’s name ever, BTW) instead takes over his life and despite living in a world where she would be eaten on sight without a moment’s thought, grows up. This book, while a level of blatant humor just a notch of ridiculous below a Christopher Moore novel, is truly about fatherhood and the lengths a father will go to for his child. Marty’s stress over a sneeze (no doctors = no medicine = Isuzu’s going to die), his obsessive baby monitoring while he’s at work (no childcare in a childless world), his search for a mother who won’t eat her, and so many more episodes of parenting presented in this book tell of someone who loves his adopted daughter more than anything he ever did in life. At its heart it is all about the relationship between Isuzu and her dad... everything else is just window dressing. If your dad has a sense of humor and can handle a good amount of cursing (and vampires in general) this would be a great father’s day gift. Guess I am going to have to read this book. Have you read Eat,Pray,Love? My mother in law gave it to me and I haven't read it yet. Now that the movie is coming out I am going to have to read it! If you have read it let me know what you think about it! By the way ... Great job on your blog. I added it to my dashboard. Haha, I didn't know Elly commented on this book. I ordered a copy of it and gave it to her for her birthday in September. I found out yesterday, even her husband is enjoying it. It really is a great book, but if you order the "real" not e-reader version, you won't get the juice box cover, it's a picture of a girls neck with two blood dots. Thank you, Kelly, for the book! I loved it and plan on giving it to all of my vampire loving friends.